In today’s market, it seems as though new technologies, apps and programs are constantly finding their way into our world. 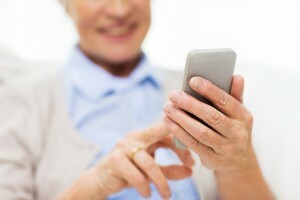 For many people today, including many seniors, the idea of new technology isn’t exactly exciting or seemingly necessary. However, there are a number of new senior-friendly creations that are finding their way to the market and that just may be worth a second-look. Getting a good night’s rest is important at any age, but is particularly important for seniors who want to be their healthiest. This bed sensor helps monitor sleep and give insight into sleep patterns and sleep quality that can be used to improve nightly rest. This can be particularly important for the many seniors today that suffer from insomnia. No matter how old we get, for many of us there are always times when we just can’t remember where we left things. With TrackerR you can add a simple chip to virtually any person or any one and track it within seconds. This means no more lost keys, wallets, remotes or people ever again. As many seniors start to age, it becomes more and more challenging to keep up with different medicines, treatments and doctor’s appointments, yet it is still important that seniors do their best to stay on top of these responsibilities. This is where MedWatcher comes in. This program allows senior citizens to follow up on their treatments, track their medical progress and even acts as a reminder to take their medications. For seniors who want to keep in touch with everything going on with their families, there is everyStory, a cloud-platform where families can share photos with voice message on them. This is a great way for seniors who may not be able to see everything going on with their kids or grandkids to not only share and access pictures, but messages and notes about what is going in in each image. This is a great activity for seniors who live independently or who worry about falling while being alone. All you need to do is tap a big red panic button if something happens and the app will send a text message alert with your GPS coordinates on it to a selected group of medical contacts or emergency contracts. This free program is designed to be a mobile scheduling reminder for adults who may need a quick reminder of appointments, lunch dates, when to take medicine and more. It is a simple yet effective program designed specifically with older adults in mind. These new technologies were designed specifically with seniors in mind and may just be able to make life a lot easier for many of today’s older adults. You don’t have to be particularly tech-savvy in order to utilize these apps and programs and since most of them are made specifically with seniors in mind, they are actually quite easy to use. Take a look at these technologies and give them a try, they may be just what you or a special senior in your life have been looking for.